The advent of the modern design hotel has been a godsend in a world that travels more than ever. It is now possible in most cities worth their salt to find a cool oasis on the urban landscape. It’s as if the very concept of design hotels was devised by the Slow trend that is sweeping the planet because they are so much more than just a place to stay. 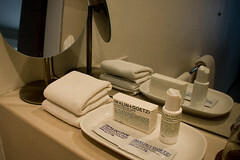 Staying at traditional four or five star hotels is often accompanied by an element of stress. You feel as though you have to act like you’re at a four or five star hotel. 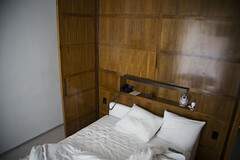 Design hotels, as a rule, give you space to be yourself, all while wrapped cosily in a duvet of elegance, style and cool. Mexico City has it’s pearl in the form of Condesa df. Located in the heart of the equally cool La Condesa neighbourhood, this hotel is truly an oasis in a city that is rife with constant movement and Latin intensity. 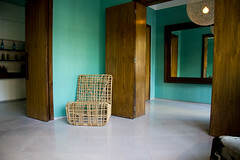 It’s bohemian chic, hip and youthful but it’s also distinguished and playfully aloof. I was in town for some Cycle Chic events - including a press conference and photo shoot on the rooftop and a Cycle Chic bike ride - and I melted into the Condesa df like I had designed the place myself. At left: My room. This is where the magic happens. Which is basically sleeping off jetlag and tequila. At right: Exclusive bits and pieces in the bathroom. The hotel is the collective brainchild of Parisian designer India Mahdavi, hotelier Jonathan Moor and Mexican architect Javier Sánchez de Sánchez Higuera. The 40 rooms are pockets of sleek and iconic goodness, complete with iPods pre-programmed with funkalicious tracks, DVD players and even an Xbox if you need to hone your FIFA skills. Which, of course, you do on occasion. At left: Entrance to the rooftop jacuzzi. Middle left: Splendid typography on the bathrooom doors. Middle right: Take out your frustrations on the boxing bag. At right: The house dog. Even he is cool. I’m sticking to the oasis metaphor but you’ll have to imagine an oasis with a humming nightlife. The rooftop terrace transforms from being a wellness mecca during the day to becoming a thriving hotspot complete with sushi bar in the evenings [which is why the iPod with headphones in the room may come in handy]. I always find that really cool hotels attract the locals and I’d rather mix with locals than tourists anyday of the travelling week. 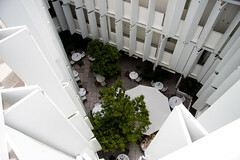 Views from the atrium and of the atrium restaurant. At left: The reception lobby. 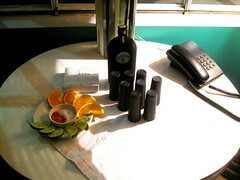 At right: Free tequila for quests in the evening. 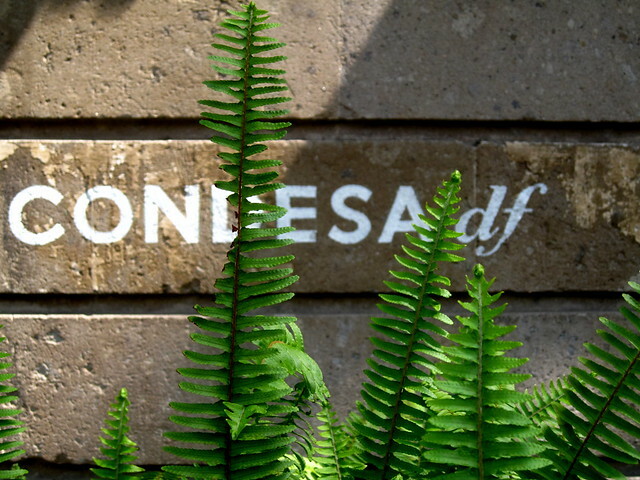 The Condesa df debunks every myth you may have heard about the Mexican capital. It’s a little piece of paradise tucked away in a delicious corner of the city oozing with slow life. A groovy base camp for exploring Mexico City. - Bicycles are available for guests. When you’re the founder of the Cycle Chic movement, that melts your heart. Although there is a public bike-share rack down the street, too. Eco-bici. - Channel 84 – the welcome channel – features a custom-made film that runs in loop. Coolest damn thing I’ve ever seen. - Great service in the reception. No task too great for thos lads. - Delicious food throughout the hotel. - Fantastic meeting room if you need it. - The free wifi connection was dodgy at best, both in the room and in the rest of the hotel. - The service in the restaurant, especially in the mornings, could have been sharper. At left: Relaxing in the lounge. At right: Checking in. 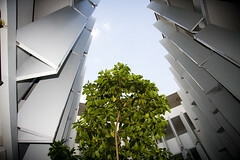 You can book on the DesignHotels.com website.